ADR contributor Kate Stegeman makes contact with Juba-based UN, IOM, civilian and SPLM sources to reflect on the recent violence plaguing the World’s youngest democracy. Fighting in Juba is inextricably-linked to sacked Vice President Riek Machar’s challenge to President Salva Kiir’s power, who represent the second largest tribe, The Nuer and largest ethnic group Dinka, respectively. The latest reports coming in from South Sudan suggest a frighteningly high death toll – with estimates ranging from at least 500 deceased to 1000s more injured civilians. With buckling state hospitals and amid the US government issuing an evacuation order for all American residents, allegations of widespread looting by army factions run amok and humanitarian aid services have been inundated with displaced people – primarily women and children – seeking refugee. All of which has occurred since clashes broke out between factions of the Sudan People’s Liberation Movement (SPLM) in the capital Juba on Sunday 15 December. While ten alleged coup conspirators have been taken into custody, sources claim that ousted Vice President and alleged coup-leader Machar is still at large. The siege has since prompted interventions by the UN Security Council, with Secretary General Ban Ki-moon attempting to contact South Sudanese President Kiir, as well as offers to help negotiate the restoration of calm in the fledgling democracy, from African Union leaders, the United States and other members of the diplomatic corps. 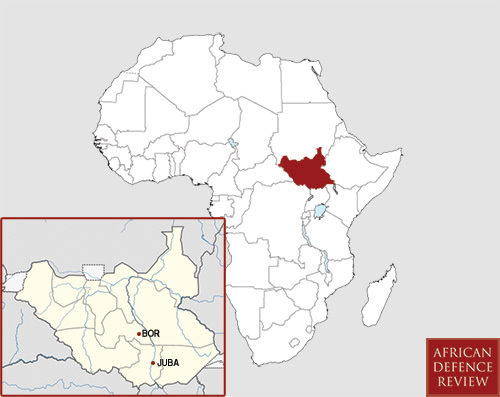 Fighting has so far been reported in Juba , and Bos in Jonglei state. After some stints abroad during Sudan’s brutal, protracted north-south civil war, Malakal returned to South Sudan in 2010 and says this is the worst she’s seen the country since independence, “with respect to fighting inside Juba but also a deepening political crisis. I wish non-violent means and approaches were considered because the situation is terrible. Shops are closed and there are shortages of food and water”. While Malakal says that the violence seemed to have been neutralised by Tuesday night she adds “yes, maybe the bullets have stopped although I am now worried about these next moments. I don’t know what will happen given the arrests of all these individuals”. In a telephone interview with African Defence Review on Tuesday, United Nations mission (UNMISS) in South Sudan’s acting spokesperson and information officer Joe Contreras tells of how Hilde F. Johnson, special representative to the Secretary General, is engaging key leaders in South Sudan in an attempt to see a peaceful way out of the crisis; and of General Secretary’s Ban Ki-moon’s attempts to reach President Kiir – no mean feat considering that phones lines have mostly been down in South Sudan since Monday morning. On Monday local South Sudanese radio outfit Miraya reported already then that more than 50 civilians were being treated for gunshot and shrapnel wounds at Juba teaching hospital. Contreras was unable to comment on the exact number of lives claimed since the fighting started, but says that he has heard reports of 66 soldiers and a high number of civilians being killed and adds, “with regards to reports that the state hospital is struggling to cope, I can’t say I am surprised as that facility has limited resources to cope with a large influx of wounded people”. On the line from Juba on Monday, International Organisation for Migration’s (IOM) Information Officer Matthew Graydon explains that the IOM has been operating in the country for many years; since 2004, followed by the special mission set up since South Sudan’s independence in 2011. He goes on to descibe that the UN compound is on the main road near to the military barracks and close to the international airport. At the time of our call he is on the crouching on the floor in the compound, hiding near other IOM staff members. On Monday, the IOM (separate from UN-run programs) was concerned about whether they would be able to get their supplies out considering the security and logistical challenges and constraints. “The distribution of supplies come from our central warehouse in Juba – when needed and we are able to move them, the tarpaulins, sleeping mats, kitchen sets, Gerry cans and purifications kits are transported by a fleet of 34 trucks. We are well positioned to respond to a humanitarian crisis,” says Graydon. However at the time he was concerned about whether they would be able to distribute the supplies to the civilians who need them most. “Considering that there has just been sustained machine gun fire for 10 minutes outside, we may need to stop our shipments” says Graydon. Malakal says, “A dusk till dawn curfew is in place. I have not been out in the streets since cars are not allowed out and it is mainly only organised forces out. I’ve heard from some friends who’ve been in the hospitals and they say the situation is messed up. I’m not hurt but I’ve heard the rounds of ammunition being fired and what sounds like grenades that have been going off. It s crazy, its sad… I don’t how else to put it”. “I’m not at the UN compound. My Belgian friend was evacuated from near there [last] evening past the curfew after 18h45 since her residence was right behind the former Vice President’s compound that was knocked down earlier. She said bullets were close, a tank knocked it down and the building has been destroyed… She said that the UNMISS compound had SPLM soldiers in the back defending civilians”. Contreras goes on to confirm that a clinic set up in the UN compound has admitted 39 patients. Not all of them have survived. “We lost one young boy brought into our medical facilities within the compound. He succumbed to critical gun shot wounds,” says Contreras. “Upwards of 10 000 civilians are taking refuge in both of the UN compounds near the Juba international airport. Water here is limited but we are dispensing water as well as a limited amount of blankets to the people who are here”. On Wednesday UNOCHA reported the number of displaced people who sought refuge at the UNMISS compounds was estimated to be closer to 13, 000. “We have no information to suggest that the curfew is over… [Tuesday] still saw the international airport closed to air traffic. I don’t expect it to be lifted; we remain in lock down mode. I can’t access the city,” says Contreras. With the protection of military conveys, by Tuesday afternoon UNMISS had already dispatched temporary housing to 6000 civilians. Even though they have erected tents, Contreras concedes that the UN does not have enough to accommodate the swelling number of displaced people arriving at their compound. On Monday President Kiir laid responsibility for the attempted coup firmly at the feet of Machar, whom was dismissed in July after a cabinet reshuffle and was more recently referred to as “a prophet of doom” with regards to Machar’s threats to challenge the power of Mr Kiir and those loyal to the President. According to a BBC report Machar has been a significant figure during the course of the last thee decades in both Sudanese and South Sudanese politics. “He is reputed to be a wily operator, switching sides on several occasions during the north-south conflict as he sought to strengthen his own position and that of his Nuer ethnic group in the murky political waters of South Sudan” says the BBC profile. On Wednesday SPLM MP in Jonglei province Dr Lual Deng tells ADR that he also holds Machar accountable for the violent outbreak. “On that evening [Sunday] December 15, there was some shooting started at the presidential guard. And this was the attempted coup… and then on the morning of the Monday, they went to the general headquarters in the place called Newside. It’s also in Juba” says Deng. The full interview with Dr Lual Deng is available on the website. Click here to listen in your browser, or subscribe to our iTunes podcast. “We are trying to capture [Machar] and bring him to justice, but I think that there is going to be a need for some wise people to intervene, and that violence is not the way to resolve this. People have to be the voice of reason and people have to dialogue and see what is the problem”. In turn, Machar has denied any involvement in the alleged coup attempt telling the Sudan Tribune it was “another undemocratic attempt by president Salva Kiir to get rid of his political critics in the party and government”. However, the question emerges: will interventions by the UN or other parties actually lead to lasting peace? By today, what was first touted as an attempted coup in the capital city, has quickly escalated into fears by the UN Security Council that that the violence clashes in the capital Juba and surrounds may lead to a full scale civil war in South Sudan, based on this radio interview by the BBC World Service. Security analyst, Red24’s Gabrielle Reid says, “Areas in South Sudan which have continuously been characterised by significant levels of insecurity, including much of Jonglei state, [and] have proved particularly vulnerable to the recent developments. Armed groups operating in the regions have taken advantage of the ensuing security vacuum. This has included groups aligned to renegade generals of the SPLA, such as Peter Gadet who we have seen remerge in Jonglei in recent days”. “It is also understood that Machar sought to challenge Kiir for the SPLM and South Sudanese presidency in the country’s 2015 general elections. It is likely that Kiir’s earlier move to dismiss Machar was an attempt by Kiir to purge the SPLM organisation of dissenters and consolidate political control in the run up to the 2015 ballot. The allegations concerning the attempted coup and retorts by Machar have fuelled already elevated political tensions in the country”. Reid adds that like any conflict in which ethnicity emerges as a factor, the conflict cannot be attributed to identity alone but rather, “requires an understanding of the patterns of difference across these groups with regards to the determinant of means of access; that competition for political power and access to resources play a major role. Identity has always proved a useful political tool for rallying strategies”. On Monday IOM’s Matthew Graydon tells ADR, “While there are difficult conditions in Juba it is comparatively better off – other areas such as Jonglei are remote and access is limited by flooding [in the wet season], poor roads and a general lack of infrastructure”. Graydon is particularly concerned about the how the recent violent clashes and alleged [failed] coup attempt will impact not only on civilians’ right to security, but now in the face of limited food, water and medical supplies, also see a rise in diseases, other health complications and poor sanitation. *Alek Malakal – name changed to protect her identity considering the precarious nature of the security situation in South Sudan at present. Ed note: at the request of ADR’s sources, some information has been removed since the original publication date of this article, due to the changing nature of the threats humanitarian workers are facing.